You address it in the newsletter. You host a zillion small group meetings. You train trainers. You provide incentives. Haven’t you made it clear that jobs are on the line? Don’t they care that this is no longer about “improvement” but about survival? You’ve shouted the organizational imperative from the mountaintop . . . and still your workforce continues to do the same old things the same old way. Why won’t they do their part? 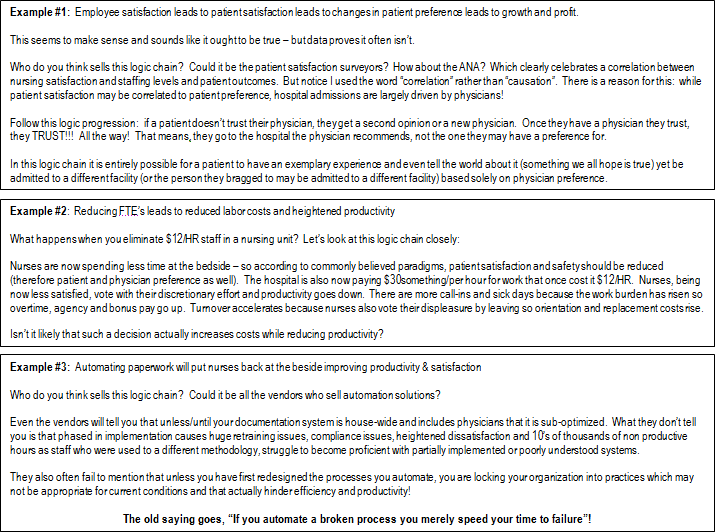 This was a situation faced by far too many senior leaders in healthcare this past year. 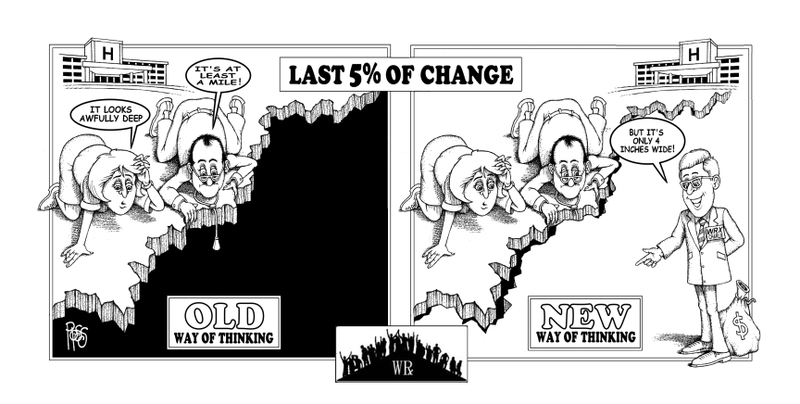 Without a real shift in understanding, it is likely to be a situation faced by many in 2008 as well. But why is it happening? Why don’t hospital workforces automatically become as good of soldiers for organizational change as they are for quality and safety? Let me share a few “lessons from the field” learned in 2007 that may shed some light on this. We recently finished an audit for a client with a world class nursing workforce. This group had been told for years that if they improved their nursing satisfaction levels they would consequently improve their patient satisfaction scores and patient preference enhancements would drive the organization to new levels of success! It took some doing, but the message eventually was believed and this organization did the hard work of remediating processes, practices and even staffing levels to arrive at the pinnacle of professional excellence: a Magnet designation! They so greatly surpassed expectations that they had the highest nursing satisfaction and patient satisfaction of the 42 hospitals in their system (above 95th%tile in each)! The growth was uncomfortable and difficult, but when it was finally complete, the sense of accomplishment and pride was palpable at all levels of the organization! For about 8 months . . .
That was when senior leadership announced that nursing would be required to reduce FTE’s because the hospital was no longer profitable. Of course they, like any good group of nursing leaders, immediately reduced their lowest skilled workforce. Still the profitability continued to erode. So they began an automation push in order to improve productivity. And productivity went down. Now comes the message that they need to revamp their scheduling methodologies, review their pay practices, reduce their agency utilization and cut their overtime. And the resistance has begun! And why not? After all, this group did every single thing they were told to do and never saw anything but negative results and an increase in the requirements for change. They raised nursing satisfaction. They raised patient satisfaction. They reduced FTE’s. They even began the painful and arduous process of automating systems that weren’t broken and none of it produced the results the organization needed. It is safe to postulate that any workforce when told to “staff up” would resist a new suggestion of “reducing FTE’s” to improve financial standing. Weren’t they JUST TOLD that adding FTE’s and improving employee engagement WOULD DO THE SAME THING? Mixed messaging radically undermines a workforce’s belief that something actually IS an organizational imperative. The mixed messaging described above clearly breeds resistance and reluctance to change. However, the mixed messaging itself derives from faulty logic directly attributable to consultants and 3rd party vendors who each have something to gain by convincing an organization that THEIR assumptions are valid. All three of these faulty assumptions came into play in creating the shifting messaging and resistance to change the organization is now facing. Our lesson learned in this is, “to deeply explore the fundamental truths of change for each organization to ensure that the results derived from change are the ones targeted by leadership”. Further, we determined to be sure “we understand the difference between “correlation” and “causation” of each proposed solution”. Most of the faulty assumptions we encountered actually had their roots in legacy measurement issues. Hospitals and their leaders are trained from inception to believe that certain key measures provide them with information necessary to effectively lead and govern. Unfortunately, we have discovered that many of the contemporary measures deployed actually confuse senior leaders and breed faulty assumptions because what they really provide is data and not “actionable information”. FTE’s per AOB – is one of the most watched numbers in healthcare. The belief is that a CEO, CNO or CFO can look at this number and “know” something about staffing and productivity in the organization. Unfortunately, the opposite is most often true and real productivity is often sacrificed “on the alter” of this measure. Consider this: A brilliant pharmacy manager decides that his mission in life is to lower the organization’s labor cost per prescription! He has figured out that COST is the number that matters for labor (rather than hours per patient day). 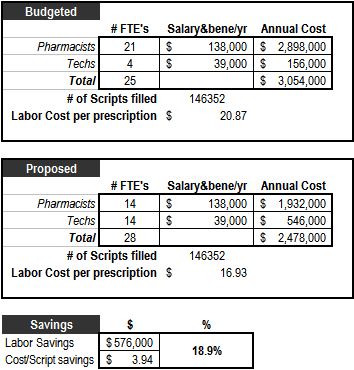 So he redesigns his workflow and begins to fill pharmacist vacancies with techs and with this simple skill mix adjustment lowers his labor cost per prescription by nearly 19%! The result for this pharmacy manager was a stern talking to and a variance report requirement because he was “over” on his budgeted FTE’s by 3.0 even though he had saved the hospital nearly $600,000! The lesson we have learned from this is that what really matters to measure is “cost per output” rather than FTE’s per anything. Since an FTE can be paid anywhere from minimum wage to nursing agency level rates (a 13,000% variance possibility), measuring anything in FTE’s can be misleading. Specifically since there is no standard for whether such FTE’s should be aggregated from worked or paid hours this measure isn’t really informing leaders about their labor practices! What if every department reduced FTE’s 20% by terming the lowest paid segment of their workforce and replacing it with 20% fewer of its highest paid. Costs will most certainly go up! The same holds true for the use of agency, overtime, bonus & incentive programs which can mask rising costs due to escalations in “the cost per hour” of the work! ! FTE’s & Hours don’t equal cost. Midnight census productivity – Since census fluctuates with every admission and discharge, and discharges predominantly occur during afternoons and evenings, logic would dictate that every unit hits its lowest census shortly after its last discharges of the day (typically between 7 and 9 pm). So it stands to reason that a midnight census would often be the low census for the day regardless of the acuity, work burden, staffing level or number of turns that occurred prior to it. Picture this: a fully occupied 20 bed unit has 16 admissions and 12 discharges between 11AM and 5PM. Doctor Bob shows up at 7PM and writes discharge orders for 6 more patients. They leave between 8PM and 10 PM. The midnight census shows 18 beds occupied. The manager on the unit was required to staff for 20 on day shift, 24 (20 in beds + 4 boarders) on evening but at midnight the census shows 18). Productivity is completely shot because the manager had to overstaff by 1 RN FTE to deal with the massive churn on days and also was forced to send home another full time nurse just 3 hours into her shift because the late day discharges would have hurt her productivity even more if she hadn’t. This measure forces constant friction as managers and staff have to continually justify the workload that occurs prior to midnight. It also forces managers to send home core staff at odd hours if there are late day discharges. We have learned this year to base productivity on “the cost of WORKED hours per patient per shift”. In summary, what we have learned this year is that there is often a “cascade effect” to change that begins with data confusion, continues with faulty assumptions and concludes with mixed messaging. The combination of which breed resistance to organizational imperatives and undermines the effectiveness of change.